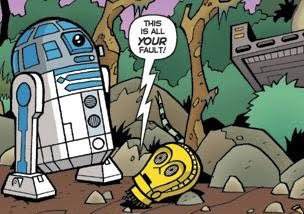 Thought Balloons - Creating Comics One Page At A Time: Why R2-D2? Short Answer? Because the Teenage Mutant Ninja Turtles were already picked. I probably took a little too much time thinking about who I wanted for my first thought balloons character choice. Ultimately, I wanted to pick something that had some kind of personal importance, and Star Wars fit that bill pretty easily. So why pick R2-D2 specifically? Because even amongst the main characters, Artoo has a rather unique role, one that makes him arguably as centric to the story as Darth Vader. He’s only one of four major players that show up in all six movies, and of those four, he’s the only one to do it without dying (as with Obi-Wan and Anakin/Vader) or getting his memory wiped clean (as with his good pal C-3PO). Sure, he gets shot up a few times, but one of the advantages of being a Droid is that can take it. It goes even further once you bring the comics into the equation, since apparently he’s still alive and ticking in Dark Horse’s Legacy series, set well over a century after the end of Return of the Jedi. Well put together little droid indeed. The other major reason is that while R2-D2 been compared to “the family dog” by CGI Clone Wars director Dave Filoni, he’s much more than that. The loyalty is certainly there, but unlike most families that go through more than one dog over the course of time, Artoo is conversely the dog that goes through several families. And while no offense to Lassie or Scooby Doo, but I wouldn’t put my money on either of them figuring out how to get the Falcon’s hyperdrive working while there’s a Super Star Destroyer breathing down their necks. Though to be fair, Krypto could probably put a few dozen holes in said Star Destroyer by flying through it several times and make the point mute. So that’s why R2-D2. Not only does he probably offer one of the widest variety of options when it comes to his native setting, but he’s also a fun, lovable, iconic character in spite of never once saying a single line of intelligible dialogue. So go have some fun with him, and may The Force Be With You. R2 – D2 – This Is The Droid You Are Looking For – Shaun Richens. This scene takes place after Return of the Jedi and during the formation of The New Jedi Order. Two Jedi Knights have infiltrated a Yuuzhan_Vong (An alien race) Miid Ro'ik starship. The Jedi master, It’Kla Akala is of the Caamasi race. His young apprentice, Pantos Werkas is of the Ithorian race. Panels 1,2 and 3 make up the top row. Panel 4 is a thin page wide shot and Panel 5 takes up the rest of the page. 1. A lightsaber cuts through a Yuuzhan Vong soldiers arm. 2. We look over the shoulder of another Yuuzhan Vong solider as he takes a shot at Pantos. 3. It’kla steps in front of the shot and deflects it. 4. We look straight on at It’kla and Pantos from the shoulders up as they stand with their backs to a wall. Lightsabers still in hand. They stand either side of a door. PANTOS: What is it we are searching for Master It’kla? IT’KLA: Someone of great importance to Master Luke. 5. A full shot of It’kla and Pantos. The door between them is now fully open. A battered and beaten R2-D2 stands in the doorway. Smoke billowing out of the corridor he has just come from. IT’KLA: Artoo. It seems it is you who has found us. PANTOS: We have risked our lives for this droid master? IT’KLA 1: This my young padawan is much more than a droid. IT’KLA 2: This is R2-D2. I did have links to the races and ships in question so everyone would get a chance to really visualize what the characters and local look like but they don't seem to transfer or work in the comments section. Please do google the stuff if you want to though. The two Jedi knights are characters I created for use in this piece, what did everyone make of them? I had a lot of fun with this piece. Not just the writing side but the research as well. All feedback on the piece would be awesome. Thanks for taking the time to read. While the basic idea is good, I have to fault you on your use of the Yuuzhan Vong as the protagonists of the script. I have my doubts that anyone who's familiar with the Vong would buy for a minute that the Vong would take a droid like Artoo prisoner rather than smashing him to pieces on the spot. Thanks for your feedback, I get what you are saying about the Vong. I wanted to use them really badly and they have a cool look and really evil, just great villains but I should have seen that they didn't fit what I really needed for the piece. I should have gone with a more bandit like race to fit my antagonist needs. I am however pleased that the over all premise was one which you felt worked ok.
@Shaun I'm not really familiar with anything beyond the films as far as Star Wars lore goes so I can't really comment on the villains and their role in this page. The page itself is pretty solid and the panel descriptions describing the action are both clear and concise. Everyone always underestimates Artoo! There isn't really a need for character names in this piece so I refer to them instead by referencing their physical traits or props they're holding. 1.1. Wide panel-- We open on a panoramic shot of an endless desert, the sun beating down from a cloudless sky and nothing but sand dunes in every direction. CAPTION (BINOCULARS): Are you sure we're even in the right place? 1.2. CUT TO: a CLOSE UP of a MAN, looking towards CAMERA, a pair of macro-binoculars held up to his eyes. The man has a hood up and a cloth wrapped around the lower half of his face and a pair of black goggles dangle around his neck. He's wearing brown robes, similar in colour and design to a Tusken Raider's. BINOCULARS: There's nothing out here. 1.3. We pan to the man's right to see another man wearing similar garb. He isn't wearing a hood or any cloth around his face though. He's in his late twenties, rugged looking with sandy brown hair and several days worth of stubble. In his left hand he holds a small, black scanning device. 1.4. Rugged looks down at the scanner. He can't believe what he's seeing. With his free hand he tries to get the attention of his partner, who has now begun to tear himself away from the macro-binoculars. 1.5. From Rugged's POV we can see the screen of the scanner. It's a sonar like device showing them what's beneath the ground in the surrounding area. A shape has started to form on the screen. RUGGED (OFF PANEL): We found it. 1.6. Fixed panel-- the shape is much clearer now. Somewhere beneath their feet, buried in the desert floor is R2D2. RUGGED (OFF PANEL): The final record of the Skywalker legacy. 1.7. The robed pair look at each other with excitement. BINOCULARS: We're gonna be rich. RUGGED: I'll get that tenure. 1.8. Wide panel-- another panoramic shot, similar to the first panel. This time we see the two robed men dwarfed by the desert that surrounds them. CAPTION (RUGGED): Come on, start digging. CAPTION: Coruscant: 1000 years after the Battle of Yavin. @Dan Wow just wow. Great page man. Wonderful concept, great visuals loved how you named the character. It all fitted together perfectly. @Shaun - The action is taut at the start and you leave enough room at the end to pay off sweetly. The structure and flow of this page is damn good. I'm glad you don't clog up the action with words. Very smart choice. This page works really well for me. @Dan - I like the concept but I might have structured the page differently for effect. I would have made the previous page, the one we don't see but can reference, have the first 5 panels. End with them looking down excited and then this page would just be the last 3 panels. Look down to see R2, see the men and their reactions, and then that last panel which I love so much. It's like these men have found a deity, and they have the means to dig, but it feels like the desert might just swallow them up first. I got a real feeling of these men not meaning much in the grand scheme of things in that final panel. And I liked that feeling. I also dug the final caption, very cool and glad you placed the prepositional information at the end and not the start. Shaun - I have no idea who the Yuuzhan Vong are, but I enjoy the respect R2 is treated with here. Dan - more respect for the little fella, I approve. My first thought was that this page might potentially be a little crowded, but I do feel the right artist could make it work. @ Dan - I wouldn't see Coruscant falling into those kind of ruins after only 1000 years, but the idea as a whole seems well thought out and well put together. 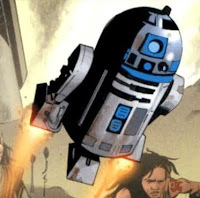 I actually had a 'distant future R2' idea as well, since I wouldn't be surprised if the little guy managed to even outlast the galaxy he lives in, but I think you did a better job with it than I would have.